I am not selling anything on this website, under any circumstances. Trade only. You can email me at: EvilDeadRules99@Hotmail.com for questions. 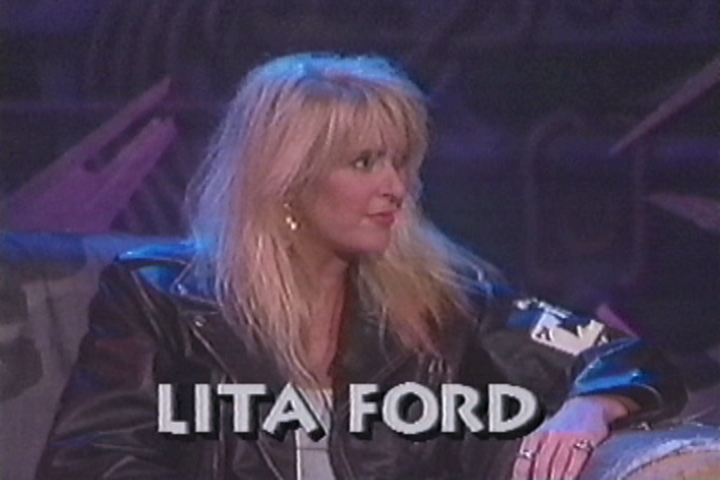 October 12th, 1991: Riki Rachtman Hosting with Lita Ford on Headbangers Ball. 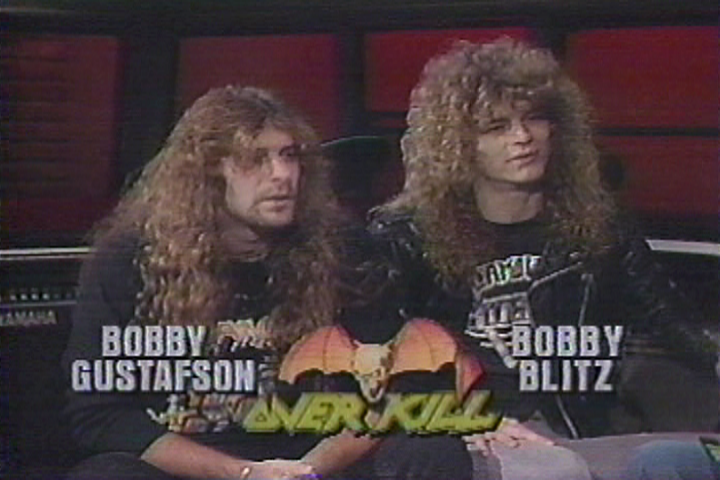 October 22nd, 1988: Adam Curry Hosting with Overkill on Headbangers Ball. 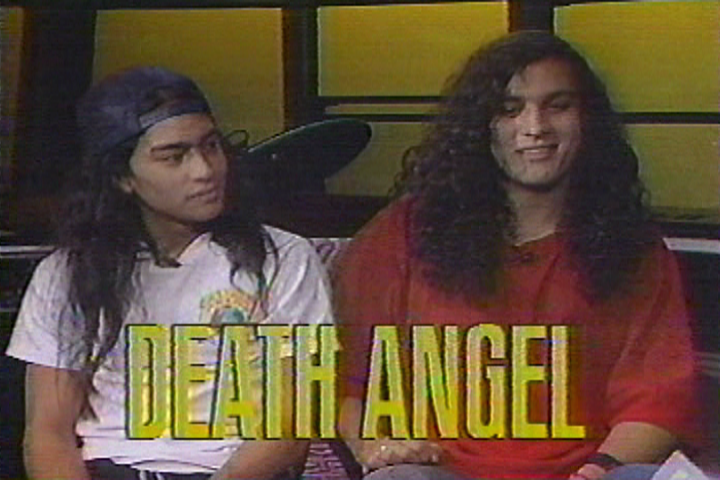 October 22nd, 1988: Adam Curry Hosting with Death Angel on Headbangers Ball. I have a lot of new high quality episodes that I still need to add to my list. I will update my .xls soon. Contact me for a trade. My trade list has grown MASSIVE over the last 5 months, I have LOADS and LOADS of ultra rare high quality Headbangers Ball Europe, Headbangers Ball Japan, Pure Rock Japan, Bang Up Rock, Mutoma World and much more that I just haven't had the time to add to my list. 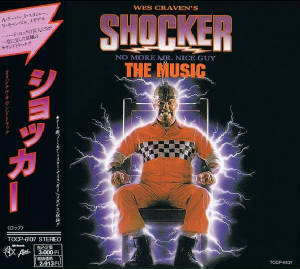 I am looking for full episodes of MTV's Metal Hammer (U.K.) Show, SKY Monsters Of Rock (With Mick Wall Hosting), anything from the SUPER Channel, Tele 5, RTL, RAW Power, and any kind of obscure European TV shows in high quality (DVD-R Only). I highly prefer standalone DVD Recorders, I don't like capture cards at all. I don't care if you have a $9,000 capture card, I still personally prefer a standalone DVD Recorder in XP Mode. Please keep that in mind. They are cheap and affordable. -I'm looking for just videos and some interviews from Tele 5, also known as MusicBox. Please do not upload any of my videos you get from me through trade on youtube or anywhere online. If that is your intention, don't even bother to contact me. I won't upload your videos online and I expect the same. It ruins the value of the music videos/shows and makes them worthless. If I catch you doing this, I will mark you as a bad trader and we won't do any future business. No excuses. Are you tired of all of these traders who have huge lists up online, but they don't even trade or even so much as reply? I am still active and looking for videos/shows. I can think of many 'traders' out there with lists up online that are no longer trading or don't bother to reply. The resolution for that would be like any good trader (or ex-trader), TAKE YOUR LIST DOWN. That's pretty simple isn't it? This site is dedicated to all that is rare metal trading. You'll find my want list, and my list of my high quality MPEG-2 VOB files (Music Videos). I've got THOUSANDS and THOUSANDS of promo videos. I've been collecting since I was 13 years old, so if you need it, I probably have it (if it's metal and it's rare). I've got many many videos that are not listed, so if you have something from my Want list, please write me and there's a very good chance that I have the video your looking for. Not only do I have thousands of metal videos alone, I've also got hundreds and hundreds of non-metal videos. If the video you are looking for aired on the MTV2 A To Z marathon, I probably have it. I have nearly every video from the A To Z marathon that aired back in 2000, all recorded high quality MPEG-2 DVDR source. I don't have as much live stuff as I do promo videos, but I do have some live bootleg stuff as well. Just feel free to take a look at my list, I've got tons of stuff that isn't even on Youtube at all! Write me if you'd like to trade, I'm willing to trade either online, or through regular mail (snail-mail). I can easily upload a full uncompressed DVDR (.ISO file) for you and delete it as soon as your done downloading, or single VOB files, or we can do regular mail trade. Your choice. Also, please do not contact me and ask me if I am looking for any Headbangers Ball episodes from AMERICA. I'm not, I have over 200+ full complete episodes of HBB from the U.S., just because an episode isn't on my list doesn't mean I don't have it (I'm probably just not trading it). However, I am looking for European Headbangers Ball episodes, (Headbangers Ball U.K. with Vanessa Warwick hosting, only full episodes though). The only Headbangers Ball U.S. episode I am looking for is 5/23/1989 With Anthrax destroying the fan's house. I DO have this, but it's only the part with the band, not the entire episode. If you have a music video that I need on my list, and it's MPEG-2 VOB source (Or DVDR), I am willing to trade full episodes of HBB just for ONE video.